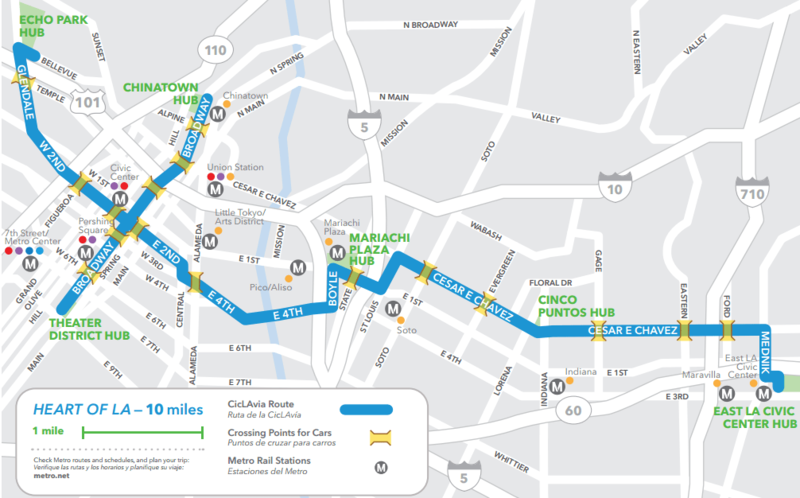 This Sunday’s CicLAvia route includes some of the same neighborhoods as past events in central Los Angeles, but it’s actually a very different route. Only a wiggle through Boyle Heights and the downtown Arts District remain from central CicLAvia route that debuted in 2010. There are lots of great sights to see along this new trajectory. Below is a non-exhaustive guide to some worthwhile stuff to check out. At hubs, you can get a free printed neighborhood guide which includes many of the sites I’ve highlighted, and other great stuff. SBLA will also be publishing a family guide to CicLAvia this week (because #StreetsR4Families), which will include some tips for everyone on how to keep cool. Most of these 12 tips for last April’s event remain good advice for this weekend. For ease of use, I’ve organized this guide into three sections: East, North-South, and West. Everything is listed east to west. 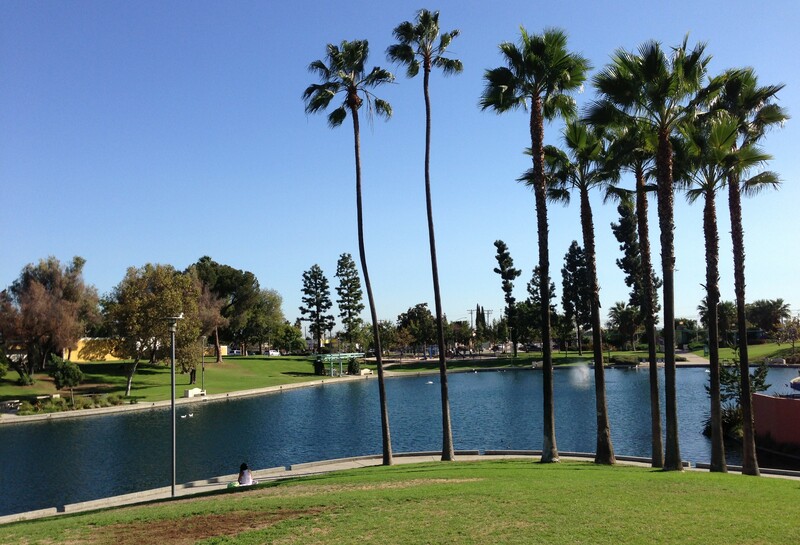 The lake at East L.A. Civic Center Park. All photos: Joe Linton/Streetsblog L.A. The county’s Civic Center anchors the east end of the route. It includes a very pleasant park (officially part of Belvedere Regional Park), with large lawn areas, a small tot lot, and a very pleasant lake. If you get here and you’re tired of walking, bicycling, skating, etc. it’s very easy to board the Metro Gold Line here, which takes you back into downtown L.A., or all the way to Pasadena. Just north of the CicLAvia route, there is what may be the most historic handball court in the known universe. There’s not a lot to see from the street today, but it’s nonetheless an important site. Built in 1923, and facing a potential development threat in 2012, the Maravilla handball court was declared a historic resource by the state of California. If you visit, and it’s open, please make a donation toward site preservation. For stories about the site, visit the Maravilla Historical Society website or watch this short video. Well, sadly, Self Help Graphics had to move on to other quarters, but their old site remains an icon. SHG at this site was a center for eastside arts and culture for decades, especially well known for Chicano artist printmaking. 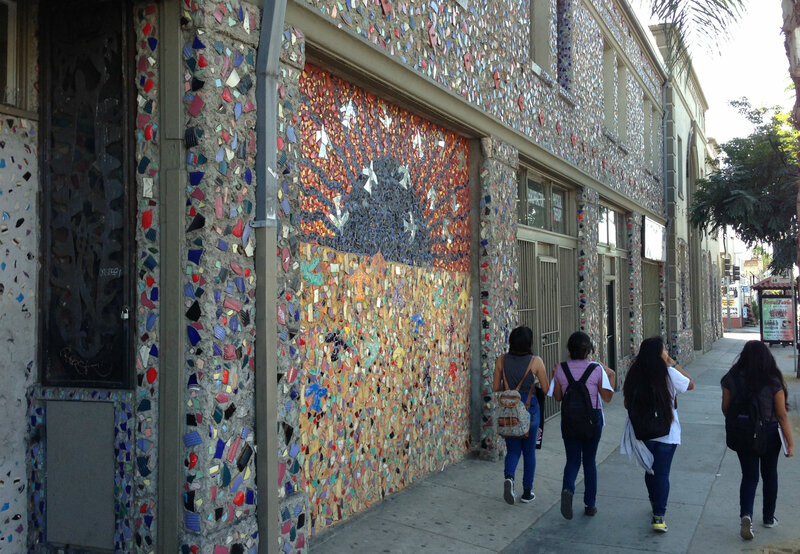 Today, the building remains covered by colorful mosaics. On the second story, facing east, view the 1998 mural Homage to Siquieros by Eva Cockcroft and Alessandra Moctezuma, which includes a recreation of David Alfaro Siquieros‘ whitewashed América Tropical mural at L.A.’s Olvera Street. This five points intersection is the boundary between the city of Los Angeles and unincorportated East Los Angeles. 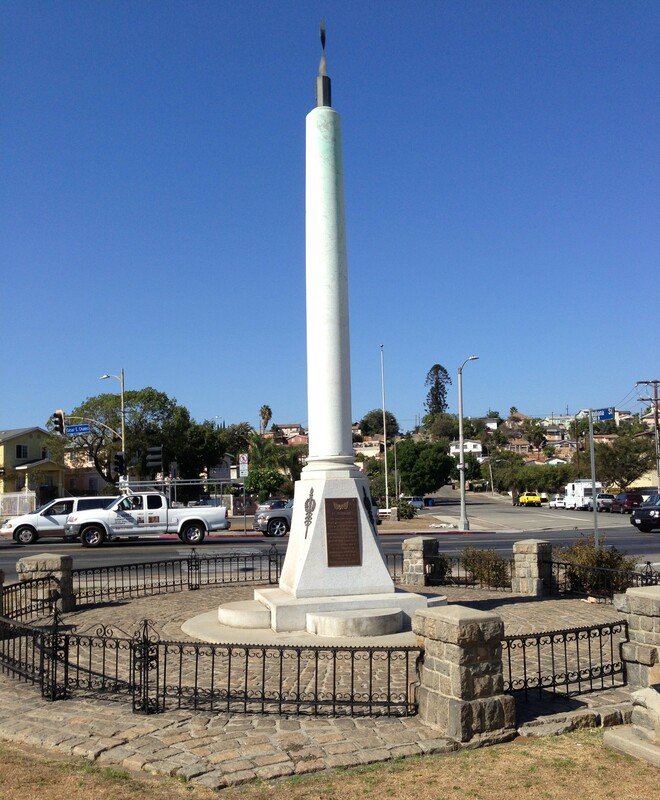 It currently features the All Wars Memorial, a tribute to “heroes of Mexican descent” veterans, and has been long discussed as a site for a future roundabout. 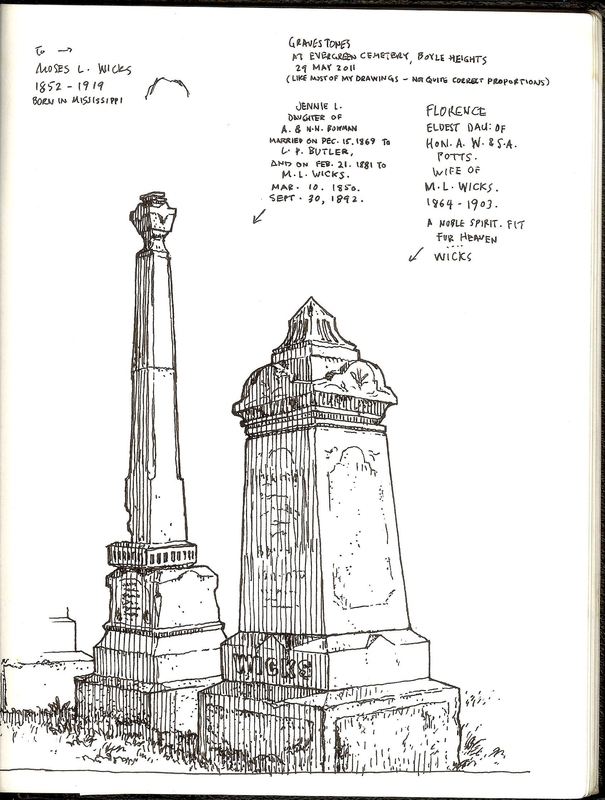 Evergreen Cemetery was founded 1877. 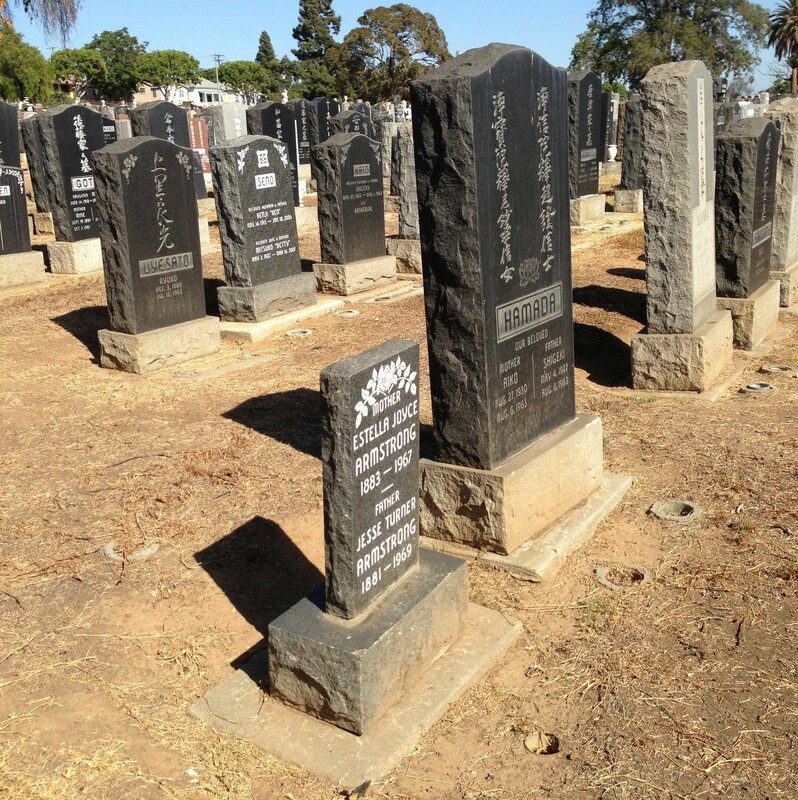 L.A. mayors and other prominent historic figures are buried there. There are segregated sections for Japanese, Latinos, whites, etc. I don’t think that bikes are allowed to go in, but pedestrians can enter at gates on Evergreen and on First Street. I go there to sketch old gravestones. In addition to all the cool old stuff inside, there’s a relatively new sidewalk jogging path that surrounds the site. For many years, Boyle Heights pedestrians, lacking safe pleasant places to walk, would exercise on the relatively-long uninterrupted sidewalk surrounding the site. In 2003, the city upgraded the sidewalk to synthetic track materials. 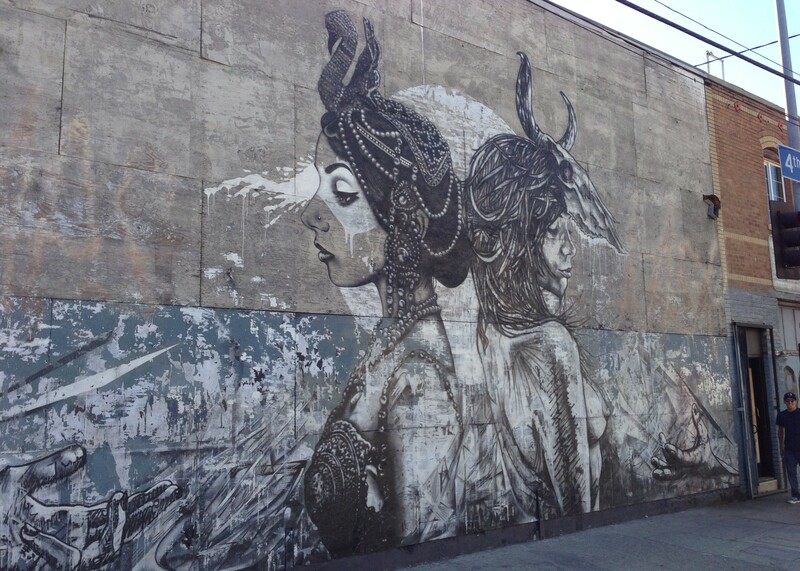 There’s a lot of great street art, pretty much all along the route (see page 37-39 in CicLAvia’s Neighborhood Guide), but I’ve singled out Boyle Heights (and the Arts District) below for high concentrations of street art. 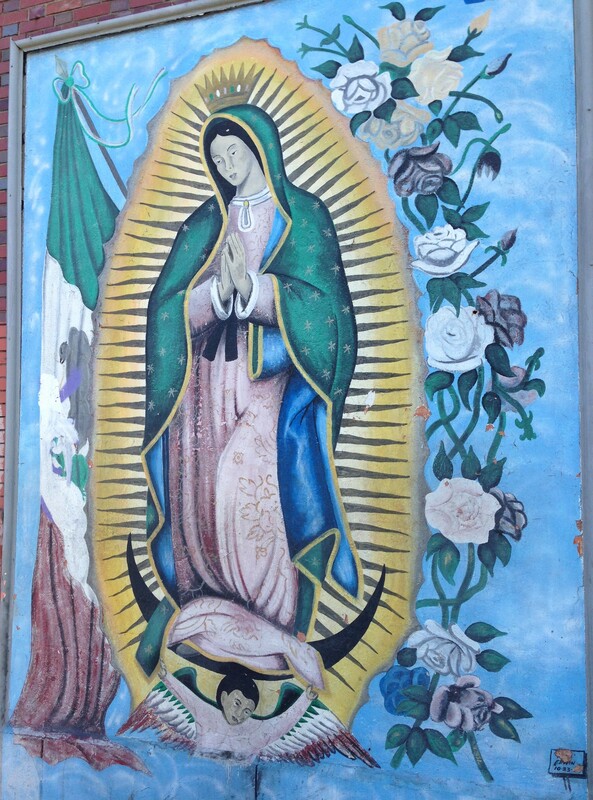 Especially on Cesar Chavez Avenue, there are hundreds of murals, large and small, permitted and unpermitted, accomplished and folksy, on storefronts, walls, utility boxes, bus shelters, and much more. 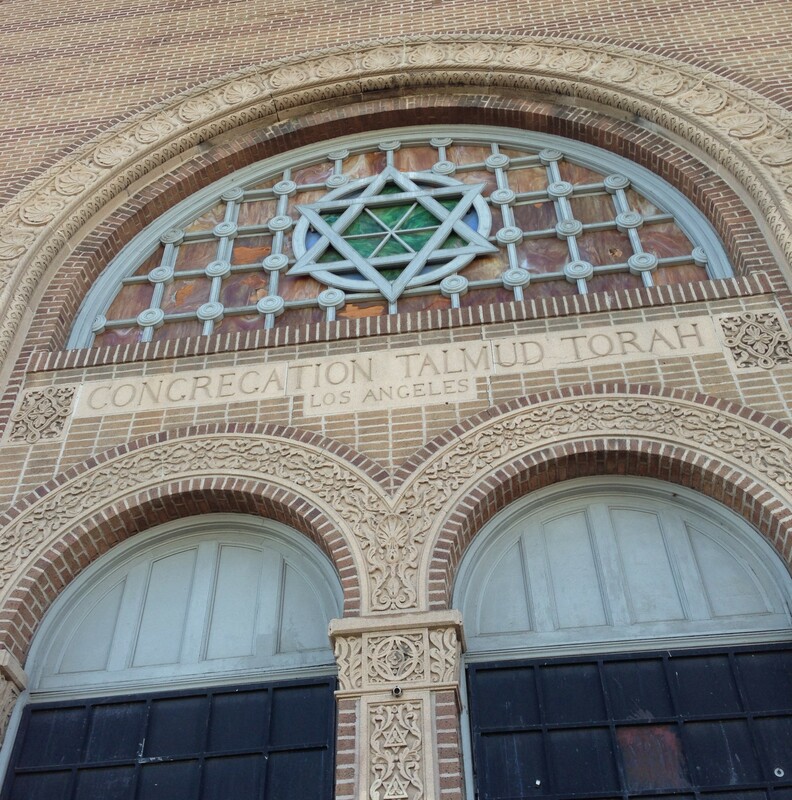 Less than a block south of the route, lies an important reminder of Boyle Heights’ Jewish history: the 1922 Breed Street Shul building. At one time, it was the largest Orthodox Synagogue in the West. Now the building is fenced off and being restored for planned use as a community center. Mariachi musicians for hire congregated at this site for many years, when it housed a gas station and a donut shop. Many mariachis lived across the street at the 1889 Boyle Hotel, now somewhat-controversially converted to affordable housing. 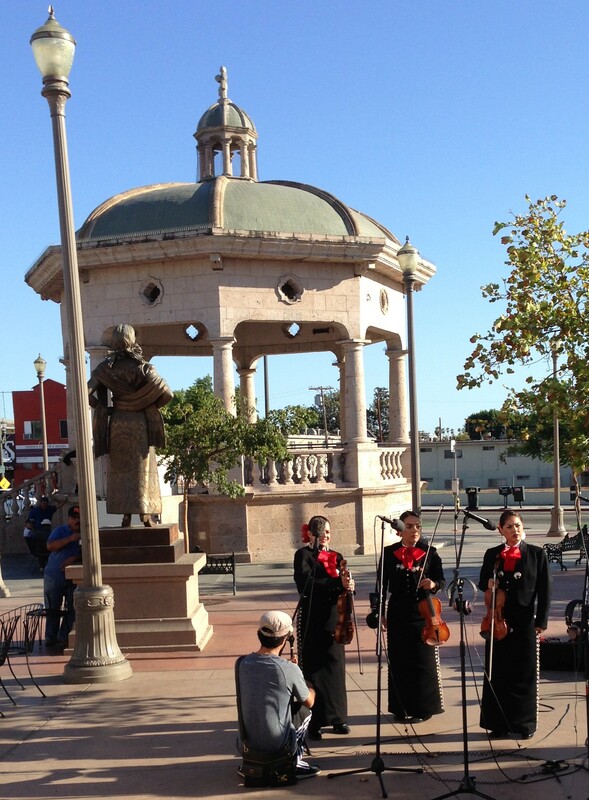 City and Metro projects have updated the public space, though it is still the place where people come to hire mariachis. The plaza also serves as an important gathering and performance space, and it is not unusual to find artists, vendors, and couples dancing to traditional music there on Friday nights. This CicLAvia, the business owners along First are throwing a blocks-long party featuring food, art, live painting, food, music, and food. So, lock your bike up at the plaza (or one of the many new butterfly and flower bike racks) and explore the variety of different flavors that comprise Mexican cuisine offered by the wonderfully welcoming family-owned restaurants that populate the street, pick up books, art, or clothing that speak to the history and culture of the area at collective Espacio 1839, peek into Don Jorge’s Casa del Mariachi to get a look at what it means to be a tailor to the mariachi stars, recharge with coffee at cafe Primera Taza, and stop by Corazon del Pueblo and Casa 0101 Theater to check out Corazon’s open mic and learn more about the support both sites offer the community through the arts. Also along this stretch of First Street: the city of L.A.’s first green thermoplastic bike lanes. Additional background on the Boyle Heights businesses at this guide to the First Street stretch by Sahra Sulaiman. There are a handful of beautiful Victorian homes on the east side of Boyle Avenue between First Street and Fourth Street. 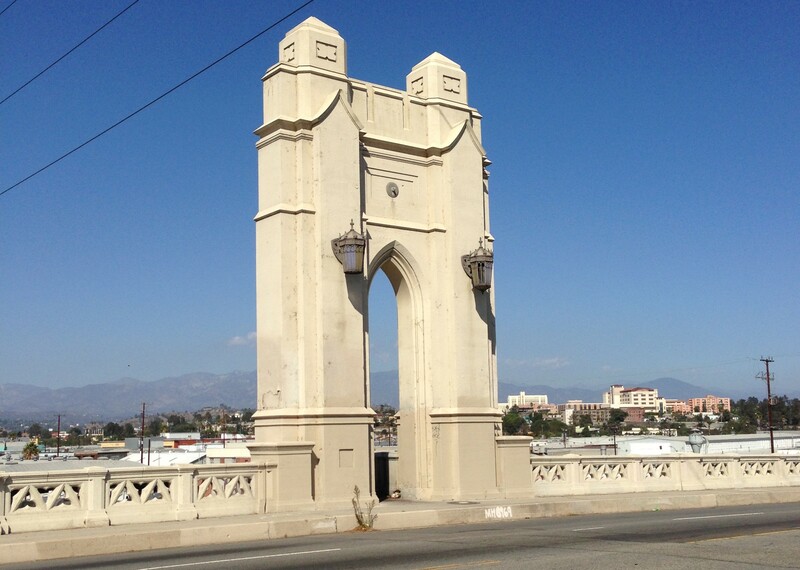 CicLAvia is one of the best times to experience L.A.’s historic river bridges. Normally car traffic is speeding across these icons. Since 2010, the 4th Street Bridge has been one of the great places on the route: a place where cyclists slow, stop, and gather. There are great views of the downtown skyline and bridges upstream and downstream. The Fourth Street Viaduct was completed in 1931. 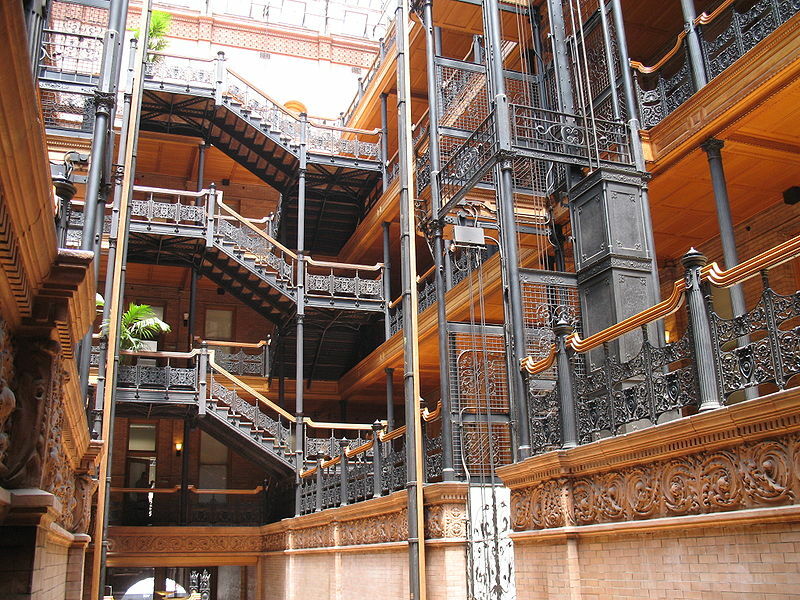 Its details are derived from European Gothic architecture, though it’s uniquely Los Angeles. There’s no bridge that looks like this in Europe or anywhere else. I like the triangle pattern in the railing, the seating areas, and the unique lighting standards. As I mentioned for Boyle Heights, there are lots of great street art murals on the CicLAvia route where it goes through L.A.’s Arts District. A few are right on 4th Street, others on adjacent blocks. L.A. First Catholic cathedral in 1876, now preserved as Vibiana event space. Known affectionately as “the Death Star,” this award-winning Thom Mayne building was completed in 2004. It houses the local branch of Caltrans, the state transportation department, and also L.A. city’s forward-thinking DOT. Completed in 2009, another relatively-successful award-winning contemporary governmental building. Even Streetsblog has to acknowledge that our local transportation-reporting rival has a very handsome building. The current building is a mishmash of original 1924 architecture, added on in 1935 and then again in the 1970s. I like the figure statues at the very top, facing east on Spring Street near Second Street. Chinatowns all over the world are known for their arches. 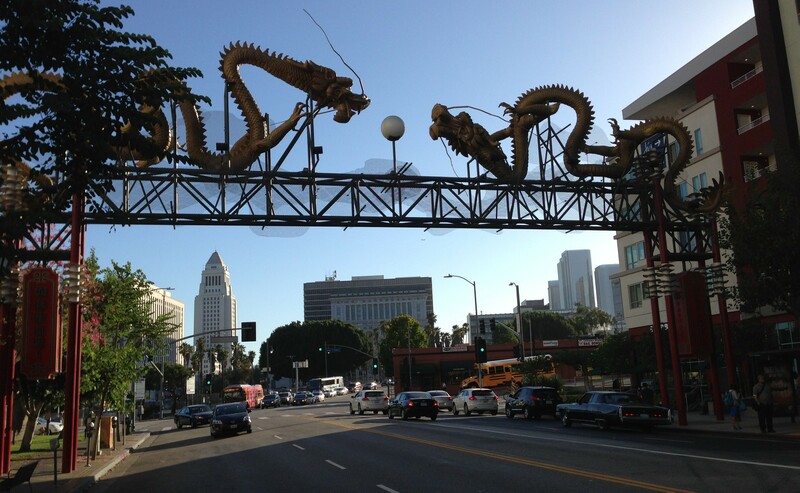 L.A.’s double-dragon contemporary Chinatown Gateway version was designed by Rupert Mok and installed in 2001. Our family loves Grand Park, especially its kid-friendly fountains! More on this in tomorrow’s #streetsr4families CicLAvia guide. Simply my favorite building in all of Los Angeles. Built in 1893, recently restored to historic utopian glory. The interior space is airy, light, just magical. Park your bike, and go inside. If you haven’t been inside, you really need to do it at CicLAvia, or sooner. 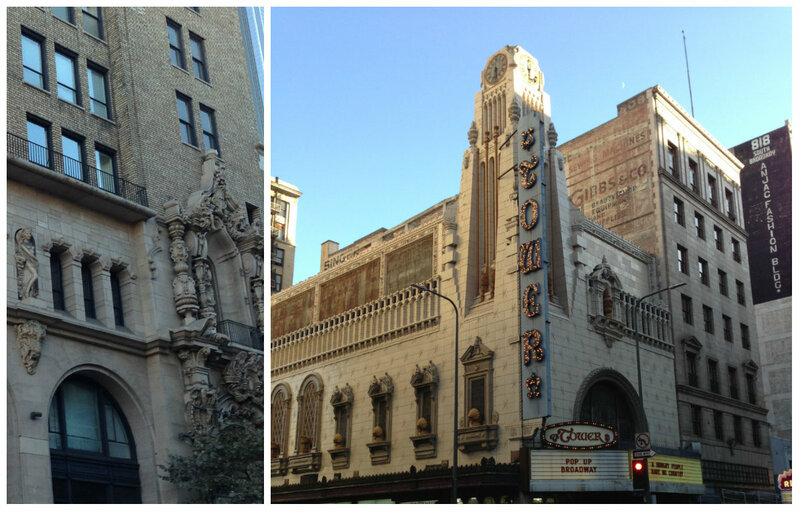 See a full historic theater listing on page 16-17 of CicLAvia’s Neighborhood Guide. But you don’t need lots of maps to find great historic theaters and other handsome architecture all the way up and down Broadway. Over the past year, L.A. City has been attempting to build on Broadway’s pedestrian bonafides by taking some space from cars and giving to people on foot. There are new painted bulb-outs, planters, posts, and some seating areas. The Broadway Dress Rehearsal project opened in August. It will be interesting to see how Broadway performs without any cars on Sunday. The 1924 Second Street Tunnel is hallowed ground for Los Angeles bicyclists. It has long been a preferred route feature of night rides; hundreds of Midnight Ridazz whistling and screaming and hooting, with sounds bouncing and echoing through the night. Wolfpack Hustle hosted its Midnight Drag Race events there. Now it’s the site of an LADOT road diet to create L.A.’s first protected bike lanes… though the “candlestick” delineators have a hard time remaining standing. Ok, only a professed street and infrastructure geek would draw attention to street lighting… but… the Glendale Boulevard lighting standards are unique. They’re decorative, historic, but actually bulky. 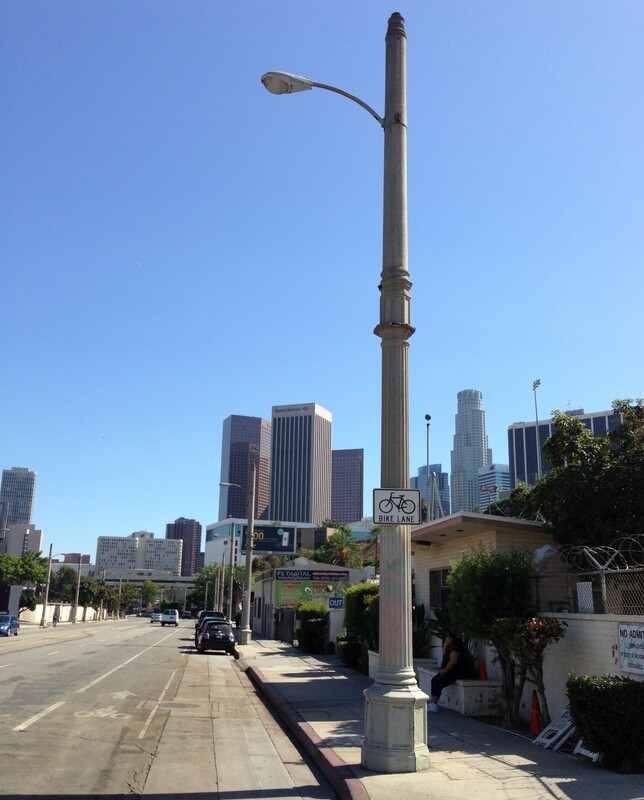 I think they are the only full-height L.A. street lighting poles that are (partially) made of concrete. They are modified, with basic cobra lighting attached to unique old poles. I haven’t been able to find any good images or articles to tell what they actually looked like when they were first installed (readers, help!). I think that they were originally designed with catenary anchors to support electical wires to power streetcars. Other great street lighting to look for on the route: 2nd Street’s two lamp electroliers and the 4th Street Bridge’s unique Gothic lighting, also nearby: find the naked ladies (ok, caryatids) on the “Wilshire Special” streetlights. Another excellent park for all ages – with great views of the downtown skyline. More deets at tomorrow’s StreetsR4Families guide. It’s not quite as handsome or as central as the 4th Street Bridge, but this 1942 beauty is from the same City Beautiful era. In its day, it was intended to streamline the intersection of multiple streetcars. And not just streetcars, but subways coming up from undergound, where today the Belmont Station apartments stand. The street names get all jumbled here, too – Second becomes Glendale, First becomes Beverly. I expect that the bridge’s sidewalks may be a good location for taking photos of this Sunday’s CicLAvia. Whew. Thanks for reading this far down. Echo Park anchors the west end of the CicLAvia route. The park and its lake were recently renovated and I think they look great. The lake is fun for paddling in and just walking around. The lotus lilly flowers are still in bloom. And it’s all downhill back into downtown. I’ve ridden around Evergreen Cemetery. Very peaceful. Great job. Enough information for three Ciclavias! When I rode around the Cemetery, I saw a couple others stroll through too. Great detailed guide! We’re excited to join lululemon athletica at the 2014 CicLAvia event! Come find us at “The Happy Place” located at the East LA Civic Center Hub from 9am-4pm. You don’t want to miss this event! You forgot about Grand Central Market on Broadway/3rd! Commercial spam. Flagging this post.